If you want to “Up” your butter game at home, just try this excellent, high quality butter from France. But be warned. If you try it once, you may never go back to regular butter. Spread a bit of this French butter on anything…some fresh asparagus, frozen peas, a baked potato, some steamed Yukon Golds, fresh bread…anywhere…and you will notice how good really good butter can taste. Any other store you would pay something like $6-7 for this 1/2 lb. pack. Trader Joe’s sells it for about $3. I’ve lately grown to buying two kinds of butter at Trader Joe’s. 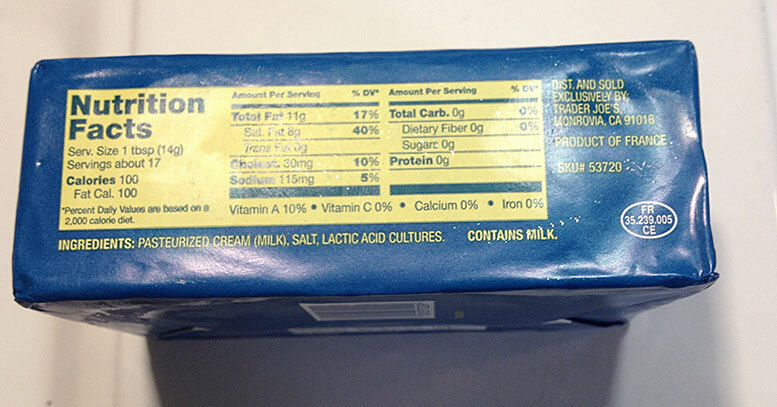 What I would call “regular butter” and the “Good Stuff” (imported butter). This is the Good Stuff. If I’m having some toast in the morning and I put some of this French butter from Brittany on it, or anything…well its just heavenly. I’ve gotten to really like two “premium” butter that TJ sells. One is KERRYGOLD butter which comes in a gold or silver package (unsalted and salted). It’s from Ireland, and is also excellent. 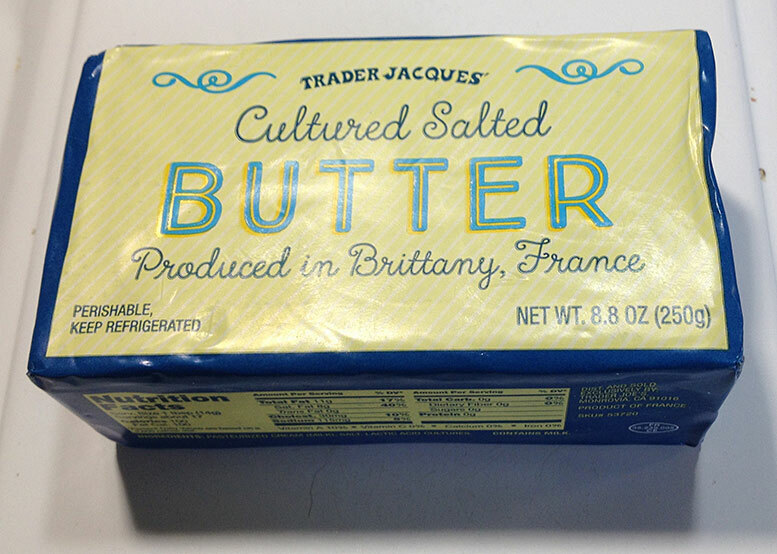 Next I tried this imported butter “Trader Jacque’s” FRENCH CULTURED SALTED BUTTER, in the blue package, which may have a slight edge on the Kerrygold butter. This comes from Brittany (Bretagne), the region in the North West of France, famous for butter and dairy products. I’ve tried to do taste tests comparing the two butters and pick one over the other. They are both so good I almost can’t pick one as “best” but I have started to buy this French one more as according to my neighbor the French one is better. The difference must be that this one is a “cultured” butter (fermented with enzymes similar to those in yogurt) to give a little bit of a tangy taste edge over the non-cultured Irish Kerrygold. 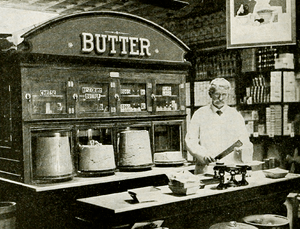 The premium imported butters naturally cost more the regular butter Trader Joe’s sells for about $3/lb which is fine, and I would say equal to Hotel Bar butter or similar. But this French butter does up your butter game. FRENCH CULTURED BUTTER comes in a 8.8 oz pack which sells for about $3 (so figure its costs about twice as much as the regular butter.) Still TJ’s French butter is I think the equal to butters you might buy in a supermarket in France. And if you compare this to imported premium butters you might see sold in an upscale supermarket here which sells imported butter, they are crazy expensive (12/lb?). So as usual Trader Joe’s is selling this premium imported butter at a still fairly reasonable price (around $6 lb.) for an excellent French butter. The Cultured French Salted French butter only comes in a salted version but I find it fine, not overly salty at all, it’s just right for most applications. I’ve grown to love it. In fact, my Japanese sister-in-law loved this butter so much when she was visiting us that she actually carried back two packs back home to Japan (!) Give it a try once, say slather some on a piece of warm French baguette just out of the oven, and you may never go back…. Mes amis, c’est La Vie en Rose! So this product was featured in a current “Fearless Flyer” then I saw it yesterday on the shelf, and thought I should buy it and report. When I got home I confess I almost instantly dug a spoon into the jar to taste it. First reaction: OMG, this is some fantastically good stuff, Trader Joe! 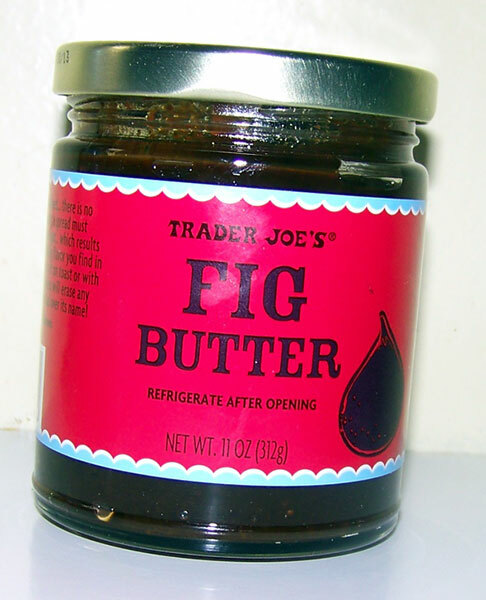 TJ FIG BUTTER is extremely tasty. For breakfast the next morning, I made a piece of TJ Tuscan Pane toast with some TJ crunchy Peanut Butter with the FIG BUTTER. People, this is a heavenly combination, you’ve got to try out! …Working with Maine-based culinary craftsmen, focused on old-fashioned, farmstand goodness and flavor, we created Trader Joe’s Fig Butter. It starts with a medley of fresh, ripe figs: Mission figs for their extreme sweetness, Calimyrna figs for their distinctive nutty flavor and Conadria figs for their nutty-sweet balance. The whole figs are dried, ground and then crushed before being slow-cooked, in small batches, with sugar, lemon and pectin. It’s a simple recipe using only the finest, freshest ingredients, and no preservatives or artificial colors. The result is full fig flavor concentrated in a smooth, spreadable butter.